Today was a busy day and I’m tired to the bone, but I want to catch you all up before I get a beer and finish my day. This morning started early, with the first sessions at 8:30. Looking at the schedule and crossing out the sessions I couldn’t go to because they were restricted, I realized one that I’d wanted to go to was restricted. Restricted to “trans men who have been fully and intentionally recognized as male”. Now, as readers of this blog, you may understand that I had some qualms about attending, but the topic was something I’m interested in, masculinity. I went back and forth on it, but as none of the other sessions were nearly as interesting, I took the plunge. I wanted to be there, I do have a male side that is very strong and I have been read as male and celebrated that reading. However, I was not part of the demographic the group was meant to serve and I knew it. I felt like everyone knew it. I struggled with the feeling that I was an imposter, an invader. I mostly kept quiet, except to introduce myself and say that I was there because discussions about masculinity and maleness had been difficult with my partner. That was an echo of what a couple of others had said, and it certainly has been a bone of contention. Other than that I sat and listened, took some notes. There were times when my female self got a big indignant at the celebrations of male privilege, but even then these men acknowledged that they knew that privilege from both sides. The most touching moments were when they talked about what they felt they’d lost during transition. That’s when it felt like a privilege to be in the room, witnessing. I didn’t go back for the second hour, the internal conflict I was having over being there and not feeling I belonged, plus, the struggle that sometimes happens in me between female and male identity, had been stressful and I needed to remain chill. My workshop was after lunch. Nick and I decided to play hooky during the second session of the day (plus there wasn’t anything that really pulled at us on the schedule). We explored the area on foot and had some yummy deli sandwiches for lunch, then went shopping at Nordstroms… Nick’s looking for just the right tie to wear at the wedding. Back at the conference, I prepared my room, moving chairs around and putting resource sheets on each. Then I actually laid down on the floor with my feet up and chilled out. Based on my experience and the reviews and some personal comments I got afterward, the workshop was a success. Wanted: Our Stories brought about 13-14 people into the room. I had more stuff to do than time to do it, but the writing exercise was a success and people were buzzing afterward. Definitely a workshop I can improve on and offer again.. pretty much anywhere. I was high on that experience and floated into the Asexuality: 101 session led by Micah (one of my very favorite people on the planet) and a panel of other Aces. Ace is a label used by some asexual people and I learned that and a whole lot more. I was very impressed by the panel and the questions being asked by those attending. During that session, I also read through my workshop reviews, taking pictures of the comments at the bottom so I’d have the feedback. After turning the packet in, I went into the big room to attend the keynote by Jamison Green. Nick is a big fan of Jamison’s and brought a fresh copy of Becoming a Visible Man for him to sign. I was there a little early and watched for Nick. That’s when James Darling came by looking for a seat. I motioned him over and he sat and we caught up. He had the same look on his face a lot of us did, Conference Face, the result of going to and/or presenting workshops that gave you a lot but also took a lot out of you. Nick joined us not long after and we settled in for the keynote. Midway through, I started ‘bonking’, nearly falling asleep while sitting there. I thought to myself, gosh, if only I had something to eat in my backpack… before I lose it completely. It’s embarrassing how long it took me to realize I did have something, yummy trail mix. I pulled it out and offered some to JD and Nick. I think JD was as hungry and depleted as I was, given the look on his face when I offered it to him. Energy restored, I was able to enjoy the rest of Green’s speachifyin’. After, Nick and I went up front to get his autograph. We introduced ourselves, I gave a pitch for my parenting workshop (Nick’s idea) and we were on our way to the All-Conference Picnic at Cal Anderson Park. It was a beautiful evening. We got our plates full of delicious Thai food and went out to sit on the grass. We hung out with other members of the Oly GO crew and relaxed, sharing our memories of the day. Once I’d cleared my plate, I went to look for Arron who was sitting with another group. Arron and I hadn’t seen each other in a long damned time.. In fact, I think it was when he and Roxy and I went to play at The Citadel on one of my visits to the Bay Area. It was so nice to hang out with him and catch up on all the things.. well, a lot of the things, I think we’d need some days to catch up on all the things. At any rate it was good and my only regret is not remembering to snap a picture of us .. so you’ll have to imagine two handsome guys hanging in the late afternoon sun looking extremely happy. Ok, now.. what happened after that…. oh yeah! Another of the Oly crew was still in the park when I was ready to head back to the hotel, so we strolled together and stopped in at Molly Moon’s Homemade Ice Cream where I had basalmic strawberry ice cream and it was extremely delicious. The basalmic wasn’t a strong flavor, in fact, it seemed to serve the purpose of making the strawberry flavor pop and taste even more fresh. I was really tired after that. Nick and some others from Oly went down to the hot tub but I hadn’t brought a suit and really needed some down time. So I hung out in the hotel room and started this blog entry. I only got partway through before I was too rummy do do more. At that point I wanted a night cap before dropping my carcass into bed, so I headed down to the hot tub. I ended up sitting on the edge of it chatting and relaxing with a bunch of folks, many of whom I’d been in sessions with. Then four of us went to the hotel lounge and had drinks and did some more debriefing about the day. One beer and I was done, excusing myself to return to the room. Knowing that first thing the next morning I’d be doing my last session, I made sure my things were in order. We also had to check out before going to the conference, so I pulled all my stuff together before falling into an exhausted sleep. 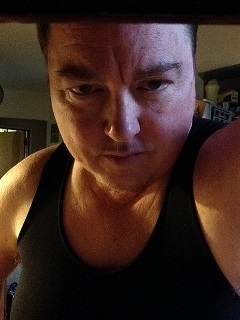 This entry was posted in butch/trans/genderqueer, community, exploring gender, gender, gender non-conforming, genderqueer, non-conforming gender presentation, transgender, Uncategorized and tagged butch, community, friends, gender, gender non-conforming, Gender Odyssey, genderfuck, genderqueer, transgender. Bookmark the permalink.